It’s 2018, not 1918. Basic skills are not enough. Here is a quote from Kentucky Education Commissioner, Dr. Wayne Lewis (who is a friend of mine). The context is a statewide conversation about higher education standards for Kentucky high school graduates. On Tuesday, Lewis said the current system already penalizes students by not actually preparing them for success. 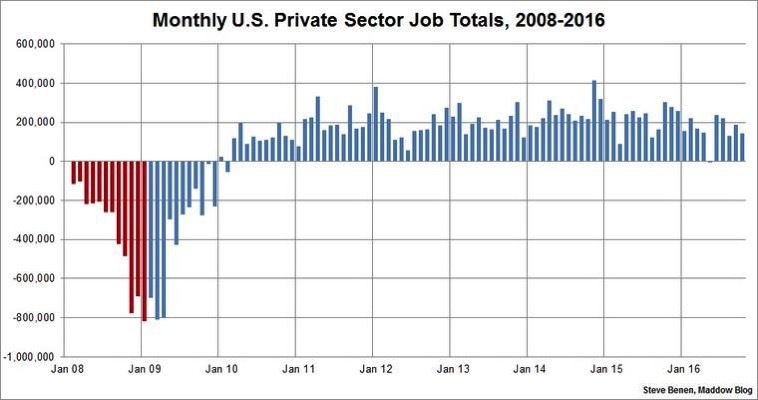 The jobs that were lost to globalization are not coming back. They are being automated. American manufacturing is actually doing very well, but much of the manufacturing work that was done by people a few years ago is now being done by machines. The same thing is true of mining and steel making. The jobs of gas station attendants were automated years ago. The jobs of retail clerks are ebbing fast. Even the jobs in Amazon’s warehouses are being automated. AI-powered systems are doing legal research, diagnosing cancer, writing music, serving as network newscasters, and doing surgery. The thing that unites the “left behind,” whether they are rural whites in communities with boarded-up storefronts and peeling paint on their homes or urban African-Americans without jobs or any prospect of getting them, is lack of the kind of education and skills that employers are willing to pay decent wages for. . . . The difference between the young people that Facebook is hiring at $140,000 per year for their first jobs and the UBER drivers in the same cities for $10 an hour is their education and skill levels. What unites the first phase of globalization with the second phase of globalization is the fact that, whether the work is manufacturing or services, whether it is highly skilled or low-skill work, the employer can look for people with the requisite skills anywhere. Whatever your skill level, you are now in competition with people all over the world who have similar skills and who are willing to work for less. That is bad news for Americans because we charge a lot for our labor. That is especially true for our low-skill and semi-skilled people – people who have basic literacy, but little more. Many nations that were largely illiterate in the 1970s have now built education systems that are capable of producing levels of basic literacy equal to those in the United States, and those newly literate people are now competing directly with the workers in the United States who have only basic literacy, which is roughly half of our workforce. The cruel fact is that our low- and semi-skilled workers – roughly half of our workforce – are very high priced in the global market for labor. That is why their real wages have not gone up in decades. They are a commodity, and the price they charge at the minimum wage level for that commodity is more than they are worth on the global market. Neither state nor federal policymakers can change that fact. And it is that fact, not unfair trade practices, that is leading ultimately to the kind of anger and despair that is corroding our politics. I refer here not only to the anger and despair of rural and urban working-class whites, but also to the despair of inner-city African-Americans and many Latinos who are also trapped by the dynamics I have just described. We must have a bigger vision for our graduates than basic skills. And we need to stop using this term as if it were enough. SIDE NOTE: While we’re at it, we also know that 3rd grade retention is one of the dumbest things we can do in school. As a researcher and former university educational leadership faculty member, Wayne should know better than this. We can’t make America great again, or Europe only white by trying to recreate the world of the past. The era of well paying industrial jobs with amazing benefits and pensions is over. The problem America and other industrial nations are facing is the girth of their populations who are not just ill equipped but not at all equipped to compete in the Modern Learning world. In a sense I suspect we are in for some difficult times because the folks who are being disenfranchised by the changes we are experiencing need for someone to blame. They can’t blame themselves and their inability to adapt and re-learn, so it must be the fault of the immigrants. What they may need to start to grapple with is countries like India, China, Singapore etc. already realize they need to change. 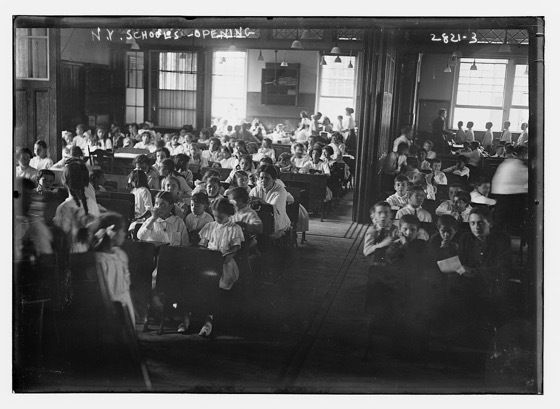 If educators are still unconvinced moving to a Modern Learning environment is a moral imperative, I hope they are beginning to come around. We cannot continue to educate students in classrooms designed for a world that no longer exists. The unrest we are beginning to see is a testament to the change we are facing and we have a professional obligation to ensure our current students are ready to adapt to an ever changing horizon. Connectivity versus isolation: Which leads to prosperity? Finally, we’re going through a change in the “climate” of technology and work. We’re moving into a world where computers and algorithms can analyze (reveal previously hidden patterns); optimize (tell a plane which altitude to fly each mile to get the best fuel efficiency); prophesize (tell you when your elevator will break or what your customer is likely to buy); customize (tailor any product or service for you alone); and digitize and automatize more and more products and services. Any company that doesn’t deploy all six elements will struggle, and this is changing every job and industry. What do you need when the climate changes? Adaptation — so your citizens can get the most out of these climate changes and cushion the worst. Adaptation has to happen at the individual, community and national levels. At the individual level, the single most important adaptation is to become a lifelong learner, so you can constantly add value beyond what machines and algorithms can do. American computer programmers have already felt the sting of offshoring. But as of now, accountants, lawyers, editors, radiologists, and the like really have not. So this will be a new experience for them, and it is predictable that they will not like it. I typically try to stay out of politics on this blog, given that I’m trying to work with a wide variety of teachers, administrators, policymakers, and community members to transform learning environments for students. But I also know that many educators woke up Wednesday morning in disbelief about the previous night’s election results. Somehow we elected a racist, xenophobic, conspiracist, serial groper of women to be the next leader of the world’s most powerful nation. 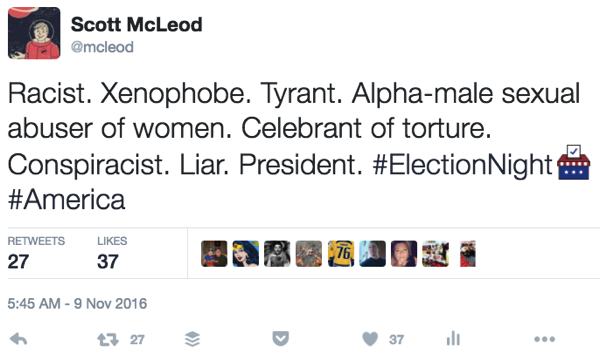 Apparently it didn’t matter to enough voters that he has – among other things – mocked people with disabilities, celebrated the use of torture, used coded anti-Semitic language, insulted the parents of deceased soldiers, denied basic science when it comes to climate change, ruminated about the casual use of nuclear weapons, and praised one of the most reviled dictators in the world. As someone who cares deeply about social justice issues, I was dismayed yesterday to hear a man behind me on the airplane say that he was ‘incredibly pumped about the GOP clean sweep – President, Senate, House, and Supreme Court – game, set, and match’ and that he was looking forward to rolling back ‘all of the BS that’s happened over the past 8 years.’ ‘Game, set, and match’: those are not words of unity and togetherness. Those are words of anger and power and revenge, words that I’m sure are frightening to women, persons of color, immigrants, and people of other faiths (just to name a few). Let’s be clear: this may be the reality in our country but the vitriolic hate and utter dismissal of basic human dignities that have been major political themes during this election represent the worst of human nature and American society. It shouldn’t be surprising that anyone who is not a conservative white male might be a little worried right now. When someone preaches so much hate for so many months, it’s an uphill road to now be a unifier. First, we must continue to model the kindness, empathy, civility, acceptance, and inclusiveness that are the hallmarks of most schooling environments. Educators know how important it is to honor each and every child, regardless of skin color, religious faith, or family background. The hateful statements and physical violence that have sprouted during the past year are antithetical in every school and classroom that I know. We must continue to explicitly and visibly model for our communities (and the nation at large) how to treat each other with grace, respect, and dignity, particularly when we disagree with each other. Schools are complicit with other societal institutions when it comes to individuals’ economic malaise and the inadequate preparation of our workforce. 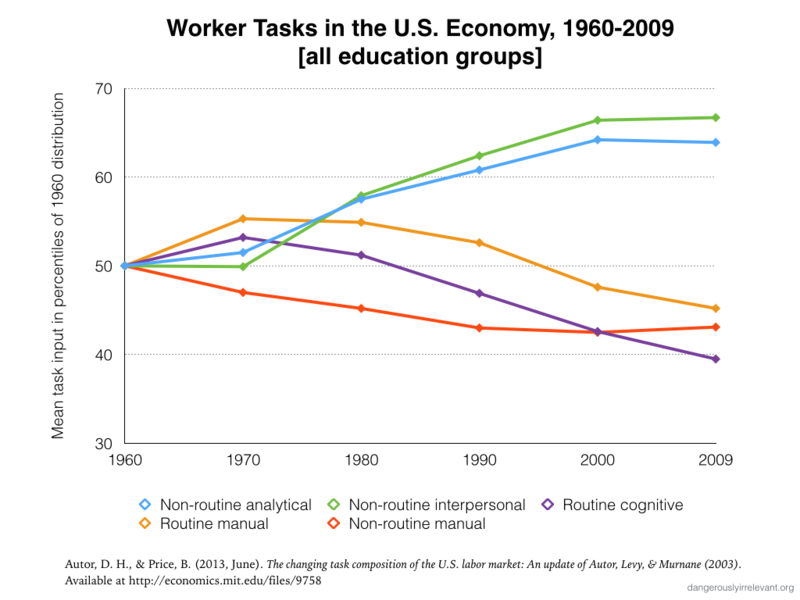 Research studies consistently show that most students spend about 80% to 85% of their school day doing routine mental work, despite the fact that the only substantive, long-term job growth in America is in professions that require non-routine mental work. Our dogged perpetuation of low-level learning environments helps foster economic insecurity and political revolts. While we continue to emphasize in our classrooms the kind of stuff that can be done in 3 seconds with voice-activated apps, search engines, or software like PhotoMath, our graduates are suffering. Schools are not just about preparing worker bees but they are necessary and vitally important components of our country’s workforce preparation pipeline. We have to own this as educators. And we must do better or we will continue to doom millions of graduates to prolonged economic hardship because they don’t have the preparation and the skills to do something different. this conversation will [soon] reach critical mass, especially around how freelancers continue to learn and upskill in such a fluid work environment. In the absence of corporate support, these independent workers need to keep hustling to stay ahead of the curve and prove they can out-innovate their peers. 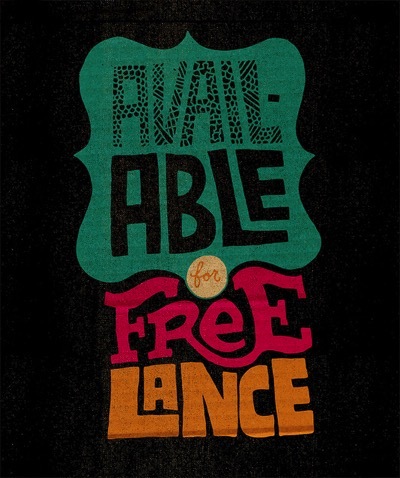 In short, as more companies choose to depend on contract workers for key parts of their business, those freelancers will see increasing competition for those gigs and, therefore, more pressure to differentiate themselves and their skills. Are most schools helping students learn how to leverage their individual interests and skill sets to ‘out-innovate their peers’ and differentiate themselves from the crowd? Are most schools helping students learn how to adopt entrepreneurial mindsets, workflows, and financing techniques in order to be both self-sufficient and competitive in a highly-complex, rapidly-shifting work landscape? Are most schools teaching students how to ‘learn and upskill’ themselves so that they optimize their chances to be selected for the next gig that they’re seeking? Are most schools still primarily running students through a ‘one size fits all’ model, assessing students in standardized ways, discounting students’ unique strengths and talents, and completely ignoring the economic and workforce realities into which they’re sending their supposedly-qualified graduates? 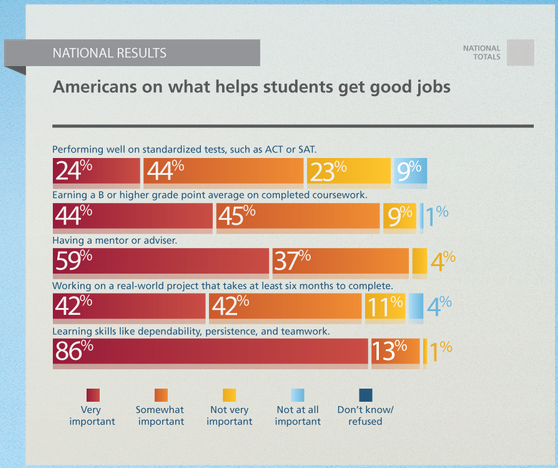 What helps students get good jobs? The latest results from Phi Delta Kappa’s annual poll… Check out standardized tests versus real-world projects in the image below. Fewer and fewer employment opportunities exist in America for both routine cognitive work and manual labor, and the gap is widening over the decades. Unless they’re location-dependent, manual labor jobs often are outsourced to cheaper locations overseas. Unless they’re location-dependent, routine cognitive jobs are increasingly being replaced both by cheaper workers overseas and by software algorithms. What kind of schoolwork do most American students do most of the time? Routine cognitive work. What kind of work is emphasized in nearly all of our national and state assessment schemes? Routine cognitive work. For what kind of work do traditionalist parents and politicians continue to advocate? Routine cognitive work. Do your graduates have a what-they-have-done file? Not their test scores or transcripts. The only way a student can have a Github portfolio is if they have a project worth working on, and the only way they can have that is if they’ve had generative interactions with the greater community; a community who has a plethora of problems worth working on. Providing real experience has become the task of the school, and it’s one that has barely been embraced.